When most people think about palm oil, if they think about it at all, they think of it as just one of the obscure and often unpronounceable ingredients printed on packages of processed foods ranging from doughnuts and crackers to candy bars and cereal. It’s the oil that isn’t coconut, safflower or grapeseed oil, and is so common as to appear totally innocuous. But for many activists, palm oil is synonymous with rainforest destruction throughout Indonesia, Borneo and Malaysia, and its production has for years been targeted by environmental activists as a major threat to the survival of orangutangs. Today, environmental activists got a boost in their fight against palm oil when the UK-based website Ethical Consumer announced that the UK’s leading biscuit (or, in American parlance, cookie) manufacturers “have made major commitments to reduce the amount of palm oil in their biscuits.” The statement is the result of a survey conducted among 50 manufacturers by Ethical Consumer and the Rainforest Foundation UK about their use of palm oil and its derivatives. The survey, which was carried out in response to the increasing habitat destruction posed by palm oil farming, found that British companies including Waitrose, M&S, and United Biscuits scored most favorably, while American companies including Kraft, PepsiCo, and Asda/Walmart did the worst. According to the Rainforest Foundation, palm oil companies are now planning to expand their operations to Africa’s Congo Basin. Palm oil companies have slashed and burned huge swaths of rainforest to make way for palm oil plantations. While cultivation of palm oil is not inherently destructive, its ubiquity in not only processed foods but also diesel fuel, cosmetics and household products (where it appears under aliases including stearic acid, palmitic acid and palmitoyl oxostearamide) makes the scale and demands of its production unsustainable. 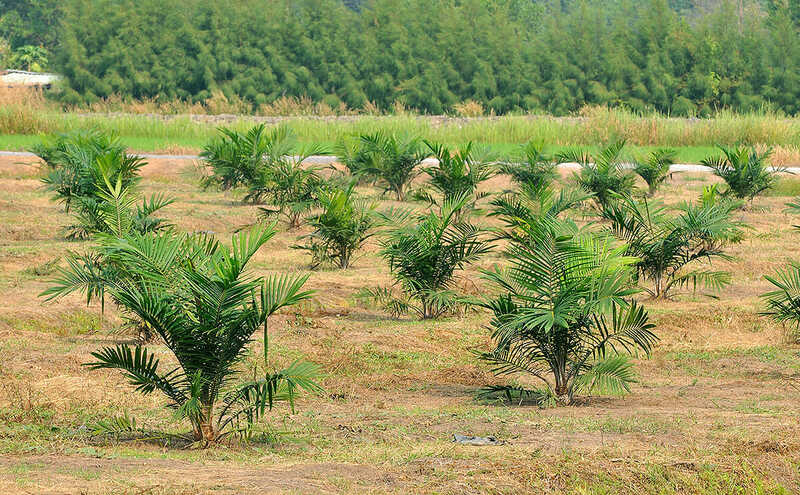 African palm trees, from whose fruit palm oil is derived, need abundant heat and rainfall to flourish. This has caused palm oil companies to slash and burn huge swaths of rainforest to make way for palm oil plantations. Clearing land for these monocultures has also been found to create high carbon emissions. Further compounding the issue is the land itself: the majority of palm plantations are grown on peatlands with soil containing high amounts of methane, a greenhouse gas. There have been attempts made to foster less catastrophically destructive palm oil cultivation: in 2004, the Roundtable on Sustainable Palm Oil, or RSPO, was established to promote environmentally responsible production. A membership-based organization comprised of palm oil growers and manufacturers, environmental NGOs, retailers and investors, it develops, implements and reviews global standards for the entire supply chain of sustainable palm oil. In late 2012, RSPO said it had certified more than 14 percent of the world’s crude palm oil and had more than 1,000 members from over 50 countries. Some activists claim that RSPO is ineffective and that its standards are low and untrustworthy. It’s certainly possible that the organization is yet another example of green-washing. Either way, if the Ethical Consumer/Rainforest Foundation survey is any indication, consumers may finally be assigning a higher value to planetary preservation than the cost of a Double Stuf Oreo.